How about the best option for booking ads in Elante Mall - Chandigarh? How about the best option for booking ads in Elante Mall – Chandigarh? To the point reasons to advertise at Elante Mall, Chandigarh. One of the largest and the most crowded malls in North India, the Elante mall in Chandigarh is impressive in its enormity. With a plethora of retail spaces for national and international brands, a courtyard filled with attractive cafes, and a food court, it has become the focal point for young and aged outgoing crowd looking for a place to hang out. The massive establishment attracts thousands and thousands of visitors daily. And that is what makes it the perfect space for advertising campaigns. Whether you have a well-renowned and established business or are just starting something new, effective and targeted advertising is the only way to take your business forward and towards lasting success. Crowded places such as the mentioned mall are perfect for advertising campaigns, mainly because of the variety of daily visitors from different sectors of society. Even with a few focused advertising points, the Elante mall provides you with the opportunity to offer your brand and your products to a plethora of people, daily. Here are some reasons why you need to book Ads in Elante mall to market your brand. One of the most critical advantages of marketing your brand in the Elante mall is that you get to connect with people that are already in a purchasing state of mind. While some people may visit with a list of things they want to buy, it does not take much to convince them to add more to their carefully curated shopping list. Yes, not all of them visit the mall to shop but the right Ad can definitely change their mind. People visit the mall for much more than just shopping sprees. They might be with their friends looking to hang out in the food court or with their family wanting to watch a movie. Whatever their purpose might be, it is impossible to ignore and remain oblivious to the advertising and promotion activities within the mall. This is what makes Elante mall the perfect space for advertising your brand. There are almost negligible chances of your brand and the product you are advertising getting ignored and unnoticed. With its attractive offerings and the numerous retail opportunities, Elante mall is the perfect setting for impulse purchasing and spontaneous shopping sprees. Haven’t you ever been just bored and looking to do something and have ended up shopping for things you didn’t plan to buy! Elante mall gives businesses the perfect opportunity to exploit this feeling and promote and sell their brand to interested and uninterested party. Once you have considered the numerous advantages of booking an ad in the Elante mall, Chandigarh, you will need to decide on the type of advertisement you want. The type and source of your advertisement play a critical role in attracting and entrancing your audience. 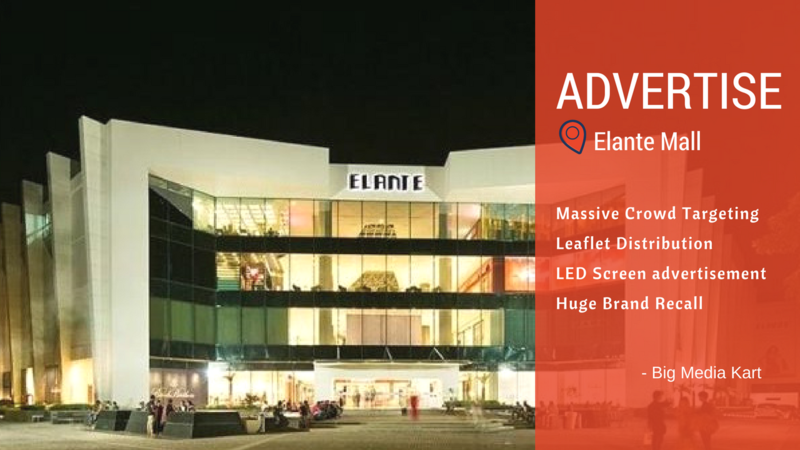 Here are some different types of advertising opportunities at Elante mall that you need to look at. Big LED Screens advertising at the Food Court– With the advent of digital technology, massive LED screens in crowded places have become one of the most successful ways to advertise and promote your brand. Surveys have proven that people are more probable to pay attention to LED screens than anything else. Being one of the most crowded and popular malls in North India, the Elante mall food court attracts thousands of hungry shoppers throughout the day. This gives brands the perfect opportunity to showcase their offerings and interest the visitor while they wait for their food. With carefully and strategically located LED screens to target the entire food court, this advertising method is a proven success. Leaflet distribution in the Food Court– If you are looking for a cost-effective way to target a large audience, leaflet distribution Ad is the perfect solution for you. More than 3 lakh targeted audience in a week, leaflets are the perfect way to interest your potential customers with attractive offers and detailed descriptions. Moreover, while people may forget the name or offer they saw in advertisements across the mall, they can hardly forget about a brand they possess a leaflet about. Glass Mirror Branding Ad in the Food Court– Food Court avails the chance of people sitting idle while waiting for their food to arrive. Glass mirror branding is the perfect way to utilize that time and attract them to the offerings of your brand. With more than 12.5 lakh visitors in a month, the food court and its glass mirror branding Ad make for a cost-effective, unavoidable, and effective advertising campaign. Along with these effective and efficient advertising possibilities, you can also avail gate branding of cash counter at the food court, table stickers in the food court, slide advertisements in PVR cinemas, and more. So, what are you waiting for? Book Ads in Elante mall, Chandigarh and take your first step towards creating a commanding and memorable brand presence.